The „ZFF MASTERS“ offers an extraordinary opportunity to gain a direct insight into the work of renowned international filmmakers. Once again, the ZFF MASTERS take place at the legendary Filmpodium and are open both to film fans and interested parties alike. Harvey Weinstein founded Miramax Films in 1979 with his brother Bob, naming the company after their parents, Miriam and Max. Under Harvey and Bob’s leadership, Miramax Films released some of the most critically acclaimed and commercially successful independent feature films, including GOOD WILL HUNTING, THE ENGLISH PATIENT, IL POSTINO, PULP FICTIONand THE HOURS. Harvey Weinstein launched The Weinstein Company, a multi-media company, with his brother Bob on October 1st, 2005. TWC and Dimension Films have released such films as I’M NOT THERE, VICKY CRISTINA BARCELONA, INGLOURIOUS BASTERDS, A SINGLE MAN and DJANGO UNCHAINED. During Harvey and Bob’s tenure at Miramax and The Weinstein Company, they have received 321 Oscar nominations and won 78 Academy Awards. Born 1941 in Winterthur, director Markus Imhoof has been responsible for several of the most important productions in Swiss film history, including the Oscar-nominated feature film DAS BOOT IST VOLL. His large collection of accolades includes the Swiss Film Award, the German Film Award and a Berlinale Silver Bear. His documentary film MORE THAN HONEY went on to become the most successful Swiss cinema film of 2012. Markus Imhoof speaks at the ZFF MASTERS about his activities as a director and his passion for writing. How do documentaries differ from feature films with regard to directing? How does he find new ideas and implement them successfully? Austrian director and screenwriter Michael Haneke knows how to make the familiar aspects of everyday lurking madness visible. He insists on applying a set of formal and narrative standards that are currently threatened with extinction by the deluge of mass-produced films. A long list almost every revered film trophy possible, from Oscar (AMOUR, 2012) to Golden Palm and European Film Award, pays tribute to his unquestionable prowess. 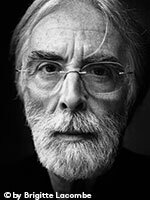 Michael Haneke speaks at the ZFF MASTERS about his work: What constitutes a Haneke film? How does he work with actresses like Isabelle Huppert and Emmanuelle Riva? 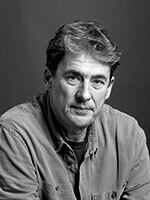 Tim Bevan is one of the most successful film producers of our time. In 1983, this native New Zealander founded the London-based production company „Working Title Films“, which he has run together with his business partner Eric Fellner since 1992. Bevan has produced such films as MY BEAUTIFUL LAUNDRETTE, the blockbuster BRIDGET JONES’S DIARY, ATONEMENT and ELIZABETH – the latter two each brought him an Oscar nomination. Tim Bevan speaks at the ZFF MASTERS about his work as a producer. What qualities make a good producer? What is the modus operandi of „Working Title Films“? Film music: What does a hero’s battle sound like? Be it a picturesque mountain village, a spectacular dam or an urban high-rise: Switzerland is often the setting for major film productions. As a location scout, Arnold H. Bucher is specialised in keeping his eyes peeled. He is able to sniff out the most idyllic, exciting or bizarre film locations that also fulfil demanding logistical requirements. In his talk, he will present examples of his work as he relates how he discovers the ideal film locations for such productions as David Fincher’s THE GIRL WITH THE DRAGON TATTOO and Michael Steiner’s SENNENTUNTSCHI. Film mistakes: Does the perfect film exist? Who has not noticed a microphone accidentally crossing the screen? Or discovered a cameraman reflected in a window? Mistakes in films are cracks in the imagination: They destroy the dazzling illusion of a skilfully constructed film world. Marius Schäfer has specialised in noticing obvious and less obvious film mistakes. He will highlight typical and noteworthy mistakes using numerous entertaining examples, tell us how they happen, and take us on the trail of the perfect error-free film. The 2013 Film Finance Forum Zurich took place on September 28, 2013 at Hotel Dolder Grand. The Film Finance Forum is a prestigious film-financing event that takes place annually in Los Angeles, Toronto, Cannes, and Zurich. The first Film Finance Forum in the German-speaking world took place in 2010 within the framework of the Zurich Film Festival. This fourth edition is organized by the Zurich Film Festival in collaboration with Winston/Baker. What’s the Deal with European Financiers? Are TV-Movies and Series Competing with Independent Cinema? What Films are Selling and Why? The second International Film Music Competition took place during the 9th Zurich Film Festival (September 26 – October 6, 2013). The competition was implemented by Zurich Film Festival in association with Forum Filmmusik and was opened to composers born in or after 1973. Over 100 entrants from 25 countries composed a score for a 44-person orchestra (big band with strings), setting the five-minute short film REIGN OF DEATH (Matthew Savage, 2009) to music. The competition culminated on September 27, 2013 in a film music concert at the Arena Cinemas in Zurich where the five best entries were premiered by the Zurich Jazz Orchestra and Zürcher Kammerorchester under the baton of André Bellmont. The five finalists were Laurent Courbier (France), Aaron Kenny (Australia), Felipe Senna (Brazil), Nathan Stornetta (Switzerland) and Jan Torkewitz (Germany). An international jury selected the winner on the same evening and presented the Golden Eye for Best International Film Music endowed with a CHF 10’000 cash prize. The jury consisted of Matthew Savage, actor and singer Carlos Leal, bandleader Pepe Lienhard, filmmaker Rolf Lyssy, composer and musician Peter Scherer as well as composer Peter Thomas. The award evening featured a top-class film music concert performed by an ensemble comprised of members from the Zürcher Kammerorchester and the Zurich Jazz Orchestra, which interpreted the soundtracks of famous screen classics and blockbuster greats under the musical direction of André Bellmont. A performance of "Crime Suite", a medley created especially for this ZFF event using the title music of famous thrillers and crime series, was an additional highlight of the evening. 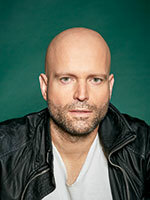 Following the film music concert, french composer Laurent Courbier was presented the Golden Eye Award for winning the second International Film Music Competition. The third International Film Music Competition will take place on October 1st, 2014 at Tonhalle Zürich. 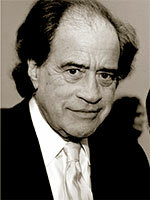 Basel-born Arthur Cohn is a legend in his own lifetime. With six Oscars, he is one of the world’s most renowned film producers, and the recipient of various honorary doctorates, other illustrious titles and awards from every important film festival. 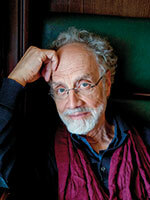 Arthur Cohn is a producer through and through, a steadfast perfectionist. Reviewing Cohn’s œuvre to date – 18 documentaries and feature films – it becomes clear that his appeal for mild and poetic, humane-orientated film is not just lip-service. His productions, for which he often uses young and hitherto unknown talent, are far beyond the mainstream. This applies as much to IL GIARDINO DEI FINZI-CONTINI as it does to ONE DAY IN SEPTEMBER, CENTRAL STATION and LES CHORISTES, to name but just a few. The Schweizer Illustrierte presents AN EVENING WITH ARTHUR COHN on Thursday, October 3, 2013 at the Arena Cinemas in collaboration with the Zurich Film Festival. An event presented by Schweizer Illustrierte in collaboration with Zurich Film Festival. Thursday, October 3, 2013, Arena Cinemas. Tickets: click here! 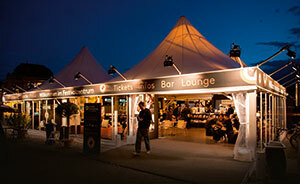 Enjoy a drink at our comfortable bar before or after viewing your chosen films. Exhibition „Stars by Edward Quinn“ at the Festival Centre. 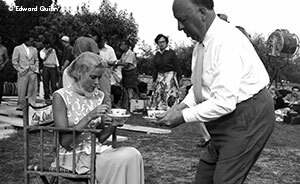 Director Alfred Hitchcock serves coffee to his star Grace Kelly. Break in shooting on the set of “To catch a Thief”, Cannes 1954. Situated at the very centre of festival activities, this small but exquisite venue is the ZFF’s official after party location. 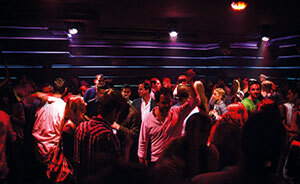 Celebrate at Club Bellevue from 22:00 / 23:00 until the early morning hours. Free entry from Mon – Thu! Closed Sunday. 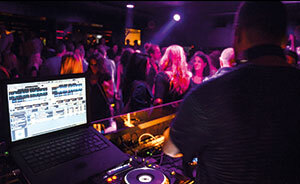 Film Music Competition After Party: DJ Ghost & DJ Shriek – for die-hard partygoers and film music fans! 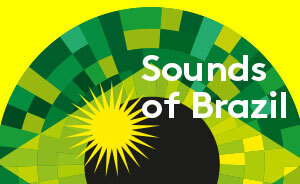 Pushking Noize & Jin Chilla, Pocahontas and Miky Merz bridge the gap between traditional and modern Brazilian music. This is where the stars of tomorrow meet – why not join them! 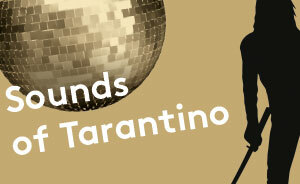 Look forward to this fantastic film after party – and celebrate with the film’s protagonists into the wee small hours. 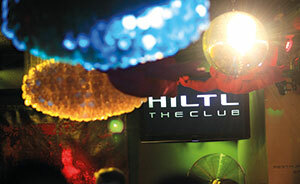 Club Hiltl, St. Annagasse 16, Pre-sale: CHF 10.- / Door: CHF 15.-, TICKETS: CLICK HERE. Free entry with FILTH ticket. 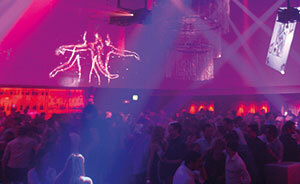 Combining the world of champagne with the world of film can lead to only one thing: An unforgettable party night! 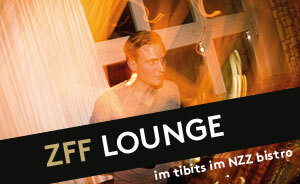 Pre-sale: CHF 20.- / Door CHF 25.